Algal production (or `primary production') represents the backbone of marine food webs and ecosystems. The productivity is often dictated by the availability of light and of nutrients. One of the main nutrients, nitrogen, is present in only very low concentrations at the surface of the western North Atlantic during the summer period (e.g., ). The algae is thus `nitrogen-starved' in this particular period and region, leading to low productivity. At the same time, certain areas of the western North Atlantic are positioned immediately downwind of large industrial and agricultural centers. These centers are known to be significant sources of nitrogen that is released to the atmosphere and carried eastward by the dominant winds before falling back to the ocean surface. This latter process, called deposition of atmospheric nitrogen, has the potential to `fertilize' the regions of the ocean surface that are nitrogen-starved and thus enhance the primary production. Such an increase in the oceanic primary productivity would be considered beneficial as it would offset part of the carbon dioxide released by human activities. The actual importance of atmospheric nitrogen deposition (AND) remains poorly known for multiple reasons. First, a large fraction of this deposition occurs through rain events over the ocean (with the atmospheric nitrogen being transported downward within rain droplets). Such rain events are naturally episodic and spatially `patchy' and thus it is extremely challenging to directly observe AND from ships. To complicate things further, multiple processes can provide nitrogen to the ocean surface and distinguishing AND from those other processes is, again, challenging (although it can be done, e.g., ). In this NSF-supported project (collaborative grants 1260574, 1259187, 1260454), scientists from Pennsylvania State University, the College of William & Mary and Old Dominion University carried out a process-oriented field effort (Martins et al., 2016, Sedwick et al., 2018) and a modeling effort (St-Laurent et al. (2017), St-Laurent and Friedrichs (2017), Da et al (2018)) to test the hypothesis that deposits of wet atmospheric nitrogen (i.e., precipitation) stimulate primary productivity and accumulation of algal biomass in coastal waters following summer storms. The modeling component had for goal to: (1) unambiguously distinguish AND from other processes that provide nitrogen to the ocean surface, (2) provide a regional `picture' that extends the limited spatial coverage of the ship, and (3) provide an estimate for the long-term effect of all the deposition events taking place over a period of 5 years. DANCE was a collaborative effort between Pennsylvania State University (R. Najjar and A. Thompson), the College of William & Mary (W&M; M.A.M Friedrichs) and Old Dominion University (ODU; M. Mulholland and P. Sedwick). M.A.M. Friedrichs and P. St-Laurent were in charge of the modeling component of DANCE. Please contact P.St-Laurent (pst-laurent@vims.edu) for inquiries about the modeling component and R.Najjar for all other questions related to DANCE. This material on this web page is based upon work supported by the National Science Foundation under Grant Number 1259187. Any opinions, findings, and conclusions or recommendations expressed in this material are those of the author(s) and do not necessarily reflect the views of the National Science Foundation. Large industrial and agricultural centers over the US mainland represent sources of nitrogen that is released to the atmosphere. 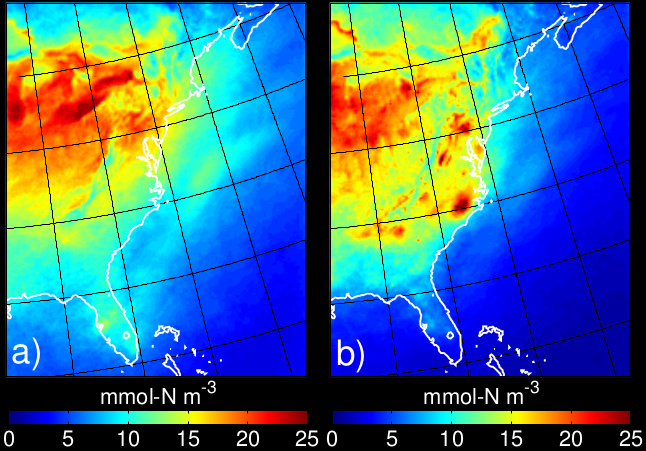 Numerical (i.e., computer) simulations conducted by the US Environmental Protection Agency (EPA, Office of Research and Development) provide a mean to `track' the distribution of this atmospheric nitrogen. For example, Figure-1 shows the typical nitrogen concentrations inside `rain droplets'. The high nitrogen concentrations extend beyond the mainland and over the ocean because of the dominant eastward winds. Figure 1: Nitrogen concentrations in rain according to an atmospheric chemistry model (CMAQ; data provided by D.B.Schwede, EPA). The concentrations are shown for two forms of nitrogen: (a) oxidized and (b) reduced nitrogen. 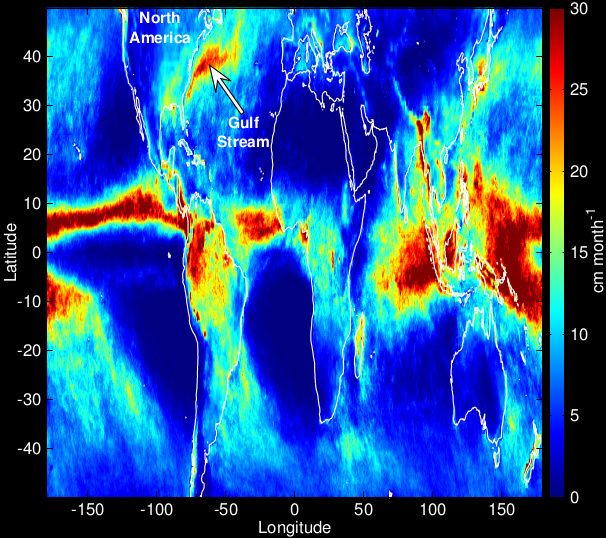 Figure-2 shows the average rainfall rate over the ocean with the `Gulf Stream rainband' highlighted. Figure 2: Annually-averaged rainfall rate from TRMM (, year 2004). TRMM (Tropical Rainfall Measuring Mission) is a precipitation analysis combining gauge analyses and multiple sensors from satellites. Note the high precipitation rates over the Gulf Stream (the `Gulf Stream rainband'). Rain events are naturally episodic and patchy. This patchiness is illustrated in a video covering the summer period of year 2005 (see caption of Figure-3). Deposition events that are intense and/or sustained (multiple hours or days) lead to a significant increase in the ocean surface nitrogen concentrations in areas and periods when the background concentrations are already low. This is the case at the surface of the Sub-Tropical Gyre and Gulf Stream regions during the summer period (Figure-3b). The nitrogen-starved algae typically consume the deposited nitrogen over a period of a few days. 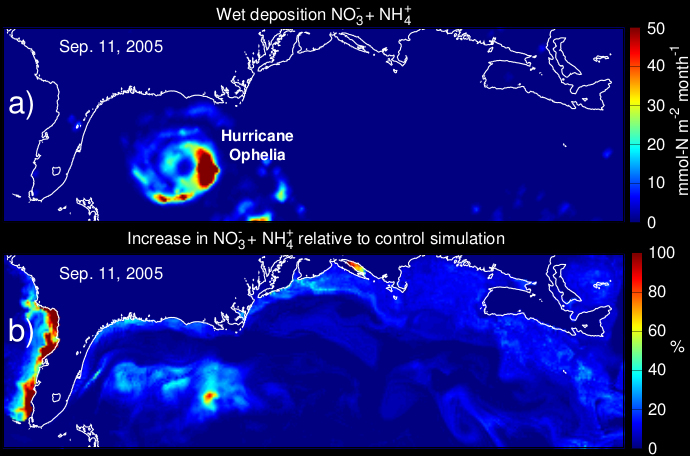 Figure 3: Deposition of nitrogen at the surface of the western North Atlantic during Hurricane Ophelia (Sept. 6-23, 2005). (a) Nitrogen deposited by the rain accompanying Ophelia (ring shape). This particular hurricane was characterized by a relatively slow and erratic trajectory that generally followed the eastern coast of the US from Florida to Nova Scotia. (b) Increase in background nitrogen concentrations caused by the deposition shown in (a). The increase is computed as the difference between two model simulations, one including atmospheric deposition and one without it (control simulation). The deposition of nutrients (panel (a)) is shown every 3 hours while the nutrient increase (panel (b)) represents an average over a day. Note the lag between the deposition events (panel (a)) and the actual accumulation of nutrients (panel (b)). Right-click on this link and select "Save File As" to download a video covering the summer season. Bernhardt, P.W., M.R. Mulholland, B. Widner, C. Sookhdeo, P. Sedwick, P. St-Laurent, M. Friedrichs, R. Najjar, 2017. The effect of atmospheric nitrogen deposition on primary productivity and nitrogen uptake along oligotrophic waters of the eastern United States, ASLO Meeting, Honolulu HI, February 26 to March 3, 2017. Da, F., M.A.M. Friedrichs, P. St-Laurent (2018), Impacts of atmospheric nitrogen deposition and coastal nitrogen fluxes on oxygen concentrations in Chesapeake Bay, J. Geophys. Res. Oceans, 123, doi:10.1029/2018jc014009. Da, F., M.A.M. Friedrichs, and P. St-Laurent, Associated dataset: Impacts of atmospheric nitrogen deposition and coastal nitrogen fluxes on oxygen concentrations in Chesapeake Bay (2018), dataset 155, doi:10.21220/gaww-m696. Martins, D.K., R.G. Najjar, M. Tzortziou, N. Abuhassan, A.M. Thompson and D.E. Kollonige, Spatial and temporal variability of ground and satellite column measurements of NO2 and O3 over the Atlantic Ocean during the Deposition of Atmospheric Nitrogen to Coastal Ecosystems experiment, J. Geophys. Res. Atmos., 121(14), p.14175-14187, doi:10.1002/2016JD024998. Najjar, R., P. Sedwick, M. Mulholland, M.A.M. Friedrichs, A. Thompson, D. Martins, P. Bernhardt, M. Herrmann, L. Price, B. Sohst, C. Sookhdeo, P. St-Laurent, B. Widner. Deposition of atmospheric nitrogen to coastal ecosystems (DANCE): A study in seasonally oligotrophic waters off the eastern U.S. AGU-ASLO-TOS Ocean Sciences Meeting, New Orleans LA, February 2016. Sedwick, P.N., P.W. Bernhardt, M.R. Mulholland, R.G. Najjar, L.M. Blumen, B.M. Sohst, C. Sookhdeo and B. Widner, 2018, Assessing phytoplankton nutritional status and potential impact of wet deposition in seasonally oligotrophic waters of the Mid-Atlantic Bight, Geophys. Res. Lett., doi:10.1002/2017GL075361. St-Laurent, P., M.A.M. Friedrichs, R.G. Najjar, D.K. Martins, M. Herrmann, S.K. Miller and J. Wilkin, 2017, Impacts of atmospheric nitrogen deposition on surface waters of the western North Atlantic mitigated by multiple feedbacks, J. Geophys. Res. Oceans, vol.122(11), p.8406-8426, doi:10.1002/2017jc013072, preprint. St-Laurent, P. and M.A.M. Friedrichs, 2017, Numerical simulations of the biogeochemical impact of atmospheric nitrogen deposition on surface waters of the western North Atlantic, dataset (1.1 terabytes), doi:10.21220/V5KB03. Boyer, T.P., J.I. Antonov, O.K. Baranova, C. Coleman, H.E. Garcia, A. Grodsky, D.R. Johnson, R.A. Locarnini, A.V. Mishonov, T.D. O'Brien, C.R. Paver, J.R. Reagan, D. Seidov, I.V. Smolyar and M.M. Zweng, 2013, World Ocean Database 2013, NOAA Atlas NESDIS 72, S. Levitus, Ed., A. Mishonov, Technical Ed. ; Silver Spring, MD, doi:10.7289/V5NZ85MT. Kodama, T., K. Furuya, F. Hashihama, S. Takeda and J. Kanda, 2011, Occurrence of rain-origin nitrate patches at the nutrient-depleted surface in the East China Sea and the Philippine Sea during summer, J. Geophys. Res. Oceans, 116, C08003, doi:10.1029/2010JC006814. Hobbs, P.V., The Gulf Stream rainband, 1987, Geophys. Res. Lett., 14(11), p.1142-1145. Huffman, G.J., R.F. Adler, D.T. Bolvin, G. Gu, E.J. Nelkin, K.P. Bowman, Y. Hong, E.F. Stocker and D.B. Wolff, 2007, Multi-satellite Precipitation Analysis: Quasi-Global, Multi-Year, Combined-Sensor Precipitation Estimates at Fine Scale, J. Hydrometeor., 8, p.38-55.